The rate of unemployment in the US is still not improving that significantly and many people who would have never imagined they would be without a job now are. If you find yourself in that unfortunate position it can be a very difficult one in many ways but especially from a financial point of view. Even if you qualify for unemployment insurance benefits those are significantly lower than the wage you used to earn. Most states have a cap on unemployment benefits of about $400 a week, however much a person used to earn, even if it was ten times that amount. So finances do need to change once you lose your job. Chances are that no longer will you be able to be rather oblivious to where your money is going (that $5 a day latte habit that actually adds up to $25 a week for example). On every credit card application there is always a little line of fairly fine print that reads something along the lines of “Alimony, child support, or separate maintenance income need not be revealed if you do not choose to have it considered as a basis for repaying this loan.” And indeed when people are employed they usually skip adding this kind of income and rely on their earnings. If you are not working though if you have this kind of income – or investment income, CDs, a decent amount of money in a savings account etc – including it on the credit card application will certainly improve your chances of being approved. Lending institutions are aware that a traditional job income is not the only way people live and the most important thing to them is that you can demonstrate that you do have the means to pay off any credit card bills you run up. 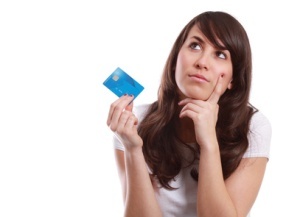 Sub prime credit cards are those that are geared towards those with lower credit scores and lower incomes. The credit limits are not that high as a general rule and there are fees attached but if you find the right sub prime credit card they are no higher than the fees attached to a “regular” credit card. Sub prime credit cards do come in for a lot of criticism from some sectors. There are those that feel that sub prime lenders prey on the vulnerable who have limited credit options and demonstrate predatory lending practices. Many of those cards however no longer exist, basically driven out by such criticisms and those that do remain have a better reputation. Orchard Bank – a subsidiary of HSBC Bank these days – are probably the biggest and best known of the sub prime credit card lenders and will likely take UI benefits, child support and savings accounts into account as a means of repayment and since HSBC took over a few years ago fees and interest rates have improved greatly and are in line with other credit cards in many cases. If you are considering a sub prime credit card you do still have to be cautious, as there are indeed some rather predatory offers still out there. Some of these cards offer a $300-$400 credit line in return for a processing fee of $95. Note that it is a processing fee, not a security deposit so that money is gone for good unless you close the account with a zero balance and a spotless payment record. Then onto that is added a $75 membership fee that will leave you with a $225 line of credit and an immediate balance to pay off before you have ever charged a thing. Rather than choose a card like this you may want to look into a good secured card instead but if you still want a card like this make sure that you read all of the terms and conditions very carefully before you apply and part with a penny. In the “old days” before the Credit Act of 2009 getting a student credit card without actually having a job was pretty easy. Your student loan funds were usually acceptable as a source of income and even if not you could have Mom or Dad cosigned and their incomes would be the one considered for credit card acceptance. The credit card companies left flyers all over college campuses and offered all kinds of special inducements for students to apply for their credit card. The Credit Act of 2009 changed all that though. In the face of reports of mounting student credit card debt now companies are not allowed to actively solicit students on campus and a student must have their own source of income, Mom and Dad’s does not count, even though if a student is under 21 they must have a co-signer these days. However that source of income can still be student loan funds, you do not necessarily need a job. Student credit cards can be very useful and if used properly can be a rather big help for the future as a student has a channel of graduating into the real world with an actual credit rating, something that will prove very useful. Careful use is the key though. Charge a little, pay off balances monthly and always on time and you should be OK.